Here are some things that I discovered and loved this month. I'm really excited that I have more makeup favorites to share. The beginning of the month I finally found the new Wet N Wild Photo Focus foundation and concealer. I had spoken about the photo focus powder on my February Favorites and I love it so much that I wanted to give the foundation and concealer a try. I have been using these two all month and I love them as much as I love the powder. I find the coverage of the foundation to be light to buildable, it applies beautifully and looks very natural on the skin. I've been applying it with a flat top brush and do a light layer all over my face. I find that even with one layer of the foundation it has really great coverage. It leaves my face feeling soft to the touch. I'm incredibly picky with drug store foundations especially since a lot of them will either make me really oily or breaks me out, but that's totally not the case with this one. This foundation looks great all day long without making me look oily. By the end of the day, I find that my t-zone looks a little glowy but it isn't anything that bothers me. It looks more like a healthy radiance. The concealer is great! I use it underneath my eyes along with highlighting the bridge of my nose and cupids bow. I love that this concealer isn't thick it's very creamy and blends out like a dream with my beauty blender. I haven't noticed any creasing either. I only wish the lightest shade was a little lighter because the lightest shade is close to my skin tone. Apart from the shade selection, I have no complaints. Wet N Wild did great with this new photo focus line. Also, both these products are vegan! Early this month I also picked up the Milani Make It Last setting spray. I have been using it all month long and I love it this stuff! This setting spray claims to last 16 hours since I don't ever wear makeup that long I can't tell you if that is true. However, I can tell you that does last all day long. I'm usually done applying my makeup by 8 am and the latest I keep it on is probably 7 pm. By the end of the day, I feel my makeup looks wonderful, nothing has faded, moved or creased. This spray is going to give you a matte finish but doesn't make you look dry. It will also help prevent any shine. This has definitely helped keep my face from getting oily throughout the day and I find that I don't even have to do any touch ups to my face. Milani is a drugstore brand so you know it's going to be cheap. I'm glad I found a setting spray from the drugstore that I love and that actually works. I even think that this setting spray works a lot better than some high-end sprays I own. Also, because I feel I need to say it Milani is cruelty-free. I absolutely love the brand Pixi, I have even mentioned a couple products from them in past monthly favorites. Not only is this brand cruelty-free, but everything I have ever tried from them has never let me down. I began seeing the new Pixi Double Cleanse all over social media and since it's a double cleanse product really made me want to give it a try. Finally, after about a month or so of constantly eyeing it at Target, I picked it up. This cleanser is meant to be used at night time. It also contains two sides; a solid cleansing oil and a cleansing cream. Whenever I am removing my makeup at the end of the day mascara is the hardest thing to remove. I have used this double cleanse a few times now and I'm totally obsessed with it. It melts off all of my makeup instantly! It shocks me every single time how quick and easy it is to remove my makeup, especially my eye makeup. First, you begin with using the solid oil onto a dry face. The oil instantly melts away all your makeup then rinse your face with warm water. Then you follow up with the cleansing cream massage onto your skin, and once again rinse off with warm water. By this point, your face is completely cleansed of all makeup. I usually hate removing my makeup because it can be a struggle, but since using this I find it to be kind of fun haha. This cleaner also has a lot of great skin loving ingredients such as vitamin E oil that protects and conditions the skin, camellia oil that is omega enriched and nourishes, peptide complex that plums and arginnie that improves cell renewal and elasticity. 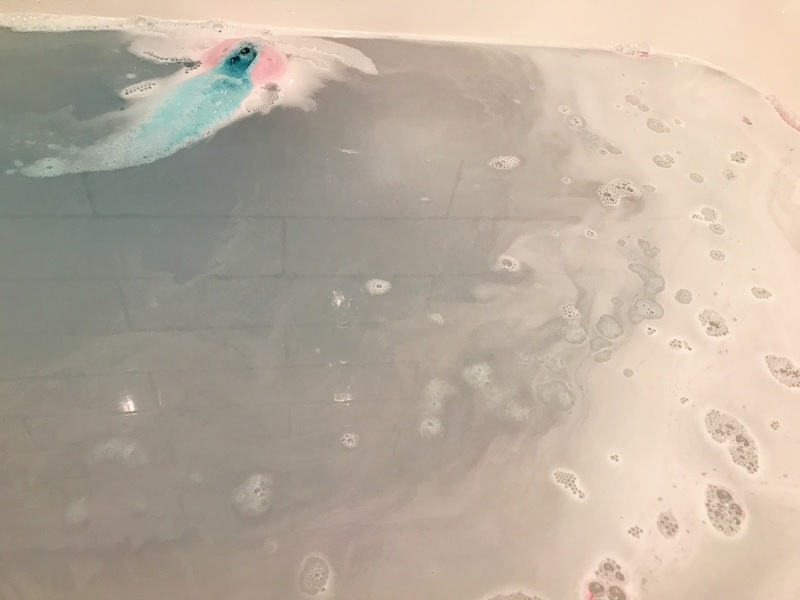 I have used a good amount of bath bombs from Lush Cosmetics and this month I found myself repurchasing the Twilight bath bomb, three times to be exact. I normally take showers in the early afternoon, but recently I have been really enjoying a bath on Sunday nights. Twilight is the perfect bath bomb to use just before bed because of the lavender oil inside of it. Lavender is really good because it helps to relax the body and mind. It also helps release melatonin which helps you have a more restful sleep. I have trouble sleeping most days for no reason and the first time I used this I was out as soon as my head hit the pillow. Finally in I don't know how long I had a restful nights sleep and it felt so great. This bath bomb is also a slow frothy fizzer and it is so beautiful to watch it come undone. It leaves your tub looking like a magical starry night as you can see from the photo above, it even has glitter inside. Don't worry the glitter doesn't stay on your body once you step out of the shower. The scent it heavenly, the perfect amount of lavender and sweet tonka. I've also been loving using this paired with the Twilight shower gel. I wanted to save the best for last. 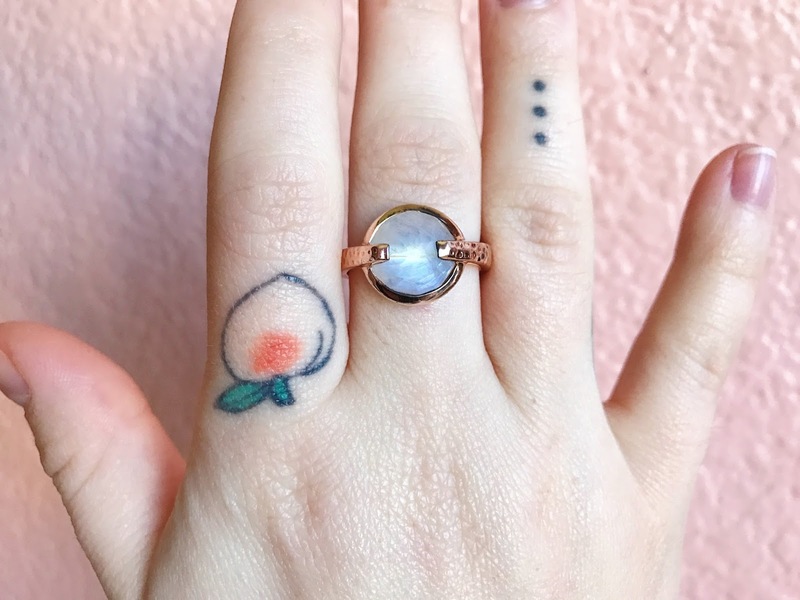 I had been eyeing the Spirituality Rainbow Moonstone Hammered Rose Gold ring by Dualitas for a couple months. Finally, I received it in the mail the last day of February since then I have been wearing it every day. I was introduced to Dualitas by Imelda. She owns a couple of their rings and had told me that the stones in their jewelry all offer different healing properties. I was so intrigued and couldn't wait to own one. I do believe that stones and crystals contain energies and powers. Dualitas jewelry is designed to have the stone touching you at all times. The rainbow moonstone was one of the main stones that caught my eye. The Properties to the rainbow moonstone are; lucid dreams, psychic protection, and tranquility. Some of the Conditions it is good for are; depression, emotional blockage, insomnia, lethargy, nightmare, and pregnancy. What made me interested in this specific stone was that it helps with lucid dreams, nightmares, tranquility but especially depression. I get nightmares often but a lot of times they tend to feel more like a nightmare version of a lucid dream. I was diagnosed with depression a few years ago and it was a really rough time in my life. Anything that may help prevent that I'm all for. This ring is absolutely stunning I love it so much and feel great wearing it. I would love to own a few more rings from them. I already have a few stones that I'm interested in. What have you discovered and loved recently? I really want to try the Pixi double cleanse, it sounds amazing! Its magical! I don't think anyone would dislike this stuff. I need to try that foundation! That twilight shower gel smells amazing! Probably my favorite so far. I think this foundation is my new holy grail. twilight by lush is just so good. its one of my fave bath bombs ever. also, i love your little peach tattoo. It quickly became apart of my top 5 favorite bath bombs. Thank you so much! I love that Wet n Wild foundation. I have yet to find the concealer and powder but the foundation is amazing. I didn't find the concealer until my third time in Walgreens. I was actually pretty sure my Walgreens was fully stocked on the line.